William J. (Bill) Crowder, age 80 of Topeka, Kansas passed away Sunday, April 14, 2019 at his home surrounded by his loving family. Bill was born August 14, 1938 to Charles and Alice Burd Crowder at Vliets, Kansas. He grew up in Blue Rapids, Kansas and graduated from Blue Rapids High School in 1956. This is where he met his high school sweetheart Kathryn Pishney and later married June 6, 1960. Bill was a hands-on type person and enjoyed working on several farms. After graduation he travelled to Colorado with a farming harvest crew. He attended Kansas State University. He then moved to Topeka where he began working at Armco Steel, he retired after 30 years. He semi-retired then began working at Heartland Park and Ramada Inn for many years. He loved spending time with his hobby of farming, having cattle and chickens, gardening, especially his prized 50# black diamond watermelon. He loved spending time with his kids and their sporting events. 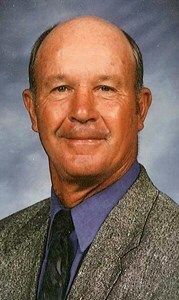 He was an avid Kansas State Football fan and was a season ticket holder since 1986. He spent many years with the family road tripping to many of the bowl games over the holidays. He was a member of Pleasant Hill United Methodist Church, where he loved being involved. He is survived by his wife, Kay of 58 years. Also surviving are their four children, Lori (John) Rea, Roderick (Lisa) Crowder, Darin (Christa), Lance (Lisa), all of Topeka; 10 grandchildren, Victoria (Brian) Stuckenschmidt, Jessica Crowder, Robbie (Rachel) Rea, Dylan Crowder, Butch Rea, Carrigan Crowder, Nathan Crowder, Caleb Crowder, Blake Crowder, and Chase Crowder; three great-grandchildren, Braden, Aria, and Liam Stuckenschmidt. Bill leaves behind a sister, Maxine Lang of Alamo, Texas, Peggy Snook, and Donna (Norman) Dederick of Topeka and many nieces and nephews. He was preceded in death by his parents, three brothers, John “Raymond” Crowder, Mahlyn Crowder, and Norval Crowder, and three sisters, Wilma Watters, Louise James, and Emma Kassebaum. Funeral services will be 10:30 am Thursday, April 18, 2019 at Pleasant Hill United Methodist Church. Burial will follow at Prairie Home Cemetery. Visitation will be 6:00 pm-8:00 pm Wednesday, April 17 at Parker-Price Funeral Home, 245 NW Independence Ave. In lieu of flowers, memorial contributions may be made to Pleasant Hill United Methodist Church, 4525 NW Button Rd, Topeka, KS 66618. To share a memory of Bill or leave a message for his family, please click the Share Memories button above. Add your memories to the guest book of William Crowder. So sorry to hear about Bill. You're in my thoughts. Mike and I are so sorry for y'all's loss of such a good man. I will remember him always as the guy who made me laugh so much. Such a good hearted warm caring wonderful man. Kay, you and Bill were always meant to be. Give me a call when you want. Love you....sending hugs, prayers and condolences. My childhood family gathering memories all center around the extended Crowder family. Uncle Bill’s constant smile and bellowing laugh fill each and every one of those memories. I am so completely sorry for your loss...he was the patriarch of such a beautiful, full and loving family. I pray he rests in peace with God knowing he lived such a wonderful life sharing his love with many. May God be with all of you as you grieve this devastating loss. I worked with Bill and Yogi for many years at Armco. Bill was always the gentleman in every sense of the word. What ever he did, he did well. Peace to the family. I worked with Bill for a year and a half at Heartland Park Topeka. I remember him as someone who would do anything he could to help a person out. Super great guy! I hope many happy memories bring your entire family comfort during this difficult time. Many memories of the Crowder family from school days at Vliets, Kansas. I was older then Bill ,more the age of Maxine and Wilma and noticed that Wilma was deceased. I lost my wife of 59 years five years ago and wanted to offer my condolences to the family. A good person who was easy to like and respect. I enjoyed our 10 years of working together at Heartland Park. You are all in our thoughts and prayers during this difficult time. May you find comfort and understanding through your faith. We are so sorry for the loss of your Father/Grandfather. Although we never had the pleasure of meeting him, Dylan spoke of him with the utmost love and admiration. You are all in our thoughts and prayers. God be with you and comfort you in your sorrow. Sorry to hear about the passing of your father. I hope fond memories help you through the sad times. Bill, in high school, worked out on our farm. I have many wonderful memories of Bill and other Blue Rapids Crowder family members. My thoughts and prayers are with all of you. Twenty Three years ago, I had the privilege of meeting the most wonderful caring people in my life. Kay and Bill Crowder were and are, the best!...Bill's sense of humor, his caring and loving ways, his undying love for Kay and children and grandchildren, his devotion to his work, church, and family were his first priorities in his life...R.I.P. my special friend!. May you find peace in Jesus arms. May God's angels surround you w/everlasting peace....all my love, Karen Price. I just now learned of Bill's death; it greatly saddens me and it brought forth a slew of happy, fun memories of growing up in Blue Rapids. Bill always had a wonderful sense of humor and had funny (sometimes fantastic) references to many mundane events. His strength and work ethic were an inspiration. I regret that our lives seldom crossed after high school. You have my deepest condolences and love. To the Crowder, Rea, and Stuckenschmidt families- I am so sorry for your loss. I always loved fishing and camping in Grandma and Grandpa Crowder’s backyard with Vicki and friends during high school years. He was so proud of all of his grandkids and loved having them all around. Peace with all of you during this difficult time. Sorry to hear of your loss. You will in my prayers and thoughts. I’m so sorry for your loss. Lance, you and your entire family are in my thoughts.